Since the introduction of the Bar Ilan Responsa database a generation ago, much discussion has focused on how accessibility and searchability change the landscape of Torah study and halachic [Jewish legal] decision-making, for better or worse. More recently, a new model has emerged, according to which texts are data, vast sets of individual pieces of information linked in different ways. Two projects can help illustrate where this is headed. This is not an incremental change to the database paradigm but something qualitatively different: applying quantitative analytical tools to our sacred texts to produce fresh and novel insights. 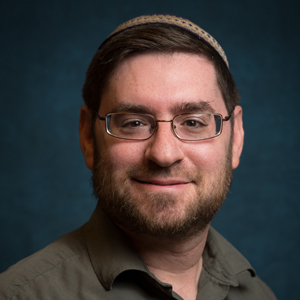 The Mi vaMi project, under development by Dr. Joshua Waxman, focuses on an oft-neglected but critically important aspect of Talmud study: the people mentioned in the Talmud and why they appear. Although the significance of this biographical information was acknowledged by scholars as early as the Tosafot [medieval French-German commentators on the Talmud], traditional study focuses on arguments and ideas, not on who articulated them. Ironically, students rarely remember that it was Rabbi Elazar, in the name of Rabbi Hanina, who said, “Whoever cites a statement in the name of its speaker brings redemption to the world” (Megillah 15a)! Mi vaMi draws upon biographical information about when and where these Sages lived and their scholastic relationship to one another. It identifies, across the entire Talmud, who is speaking in a given discourse and how the participants interact (e.g., citation, inquiry, objection, support) to build a graph database of interactions. 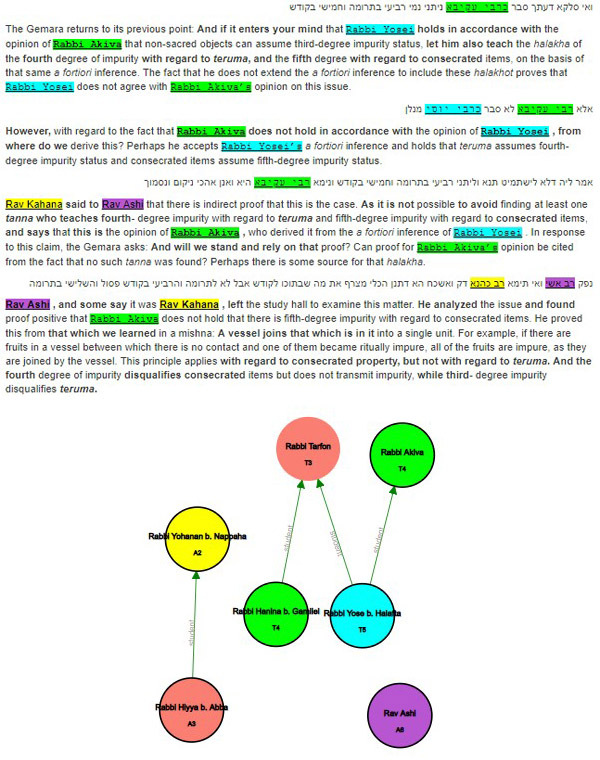 Within a given page, it marks up the Sages by color to highlight their scholastic generation and displays graphs to show the scholastic relationships. This sort of knowledge, not typically accessible, now jumps off the page and provides a qualitatively different experience to the Talmudic student. In 2017, Elli Fischer and Moshe Schorr (a computer science student at the Technion) began HaMapah in order to map, through responsa (she’eilot u-teshuvot), the reception and authority of different poskim [arbitrators and adjudicators of Jewish law] across space and throughout their lifetimes. Their studies provide general insights into the nature of halachic authority, the personalities of individual poskim, and sometimes even insights into specific responsa. Their goal is to eventually produce a comprehensive tool for analyzing, mapping and comparing responsa according to any number of variables. When complete, the project will incorporate citations of earlier texts, and each teshuvah [responsum] will be categorized by topic. 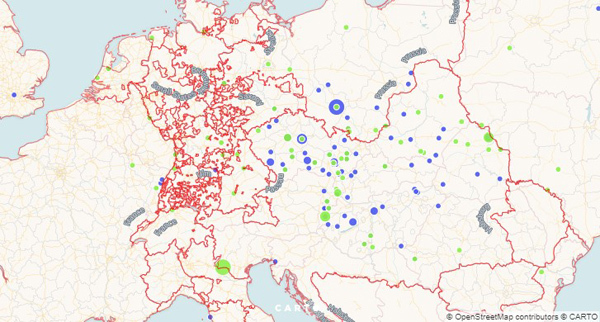 Users will be able to run queries such as “Show me every she’eilah [inquiry] about eruv [a ritual enclosure] that arose in Lithuania between 1850 and 1900”; “Show me every instance of an Ashkenazic posek between 1500 and 1650 quoting Rambam”; or “Show me every teshuvah that quotes both Rabbi Shlomo Kluger and Rabbi Moshe Sofer.” The possibilities are limitless. These projects will not and cannot replace the direct encounter with the text or with a teacher; on the contrary, they highlight that the human encounter between teacher and student or between peers forms the very basis of those very texts. 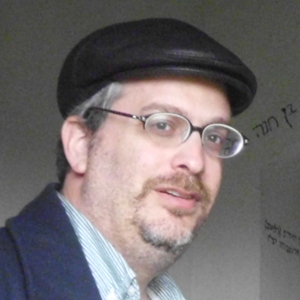 While harnessing contemporary approaches of computational linguistics and machine learning, these projects are not about what comes after the book but about what came before it: a debate in a Talmudic-era study hall, a thorny question that a small-town rabbi decides to forward to a trusted authority or any other encounter between our greatest Sages and the unique conditions of both time and place. The projects seek to enhance our fulfillment of the words of Rav Gidel: “One who relates a statement in the name of its author should envision the author of the statement as though he is standing before him” (Yerushalmi Shabbat 1:2).